About a year ago, I watched the 2008 Palestinian film Salt of this Sea, about a Palestinian-American woman named Soraya and her quest to reclaim her family’s home in Jaffa. The film has quite a few agonizing moments: in one scene, Soraya and her Ramallah-born boyfriend Emad are squatting in what remains of his ancestral village, well west of the Green Line. The illusion that they might build a new life atop these ruins is interrupted by a stern Israeli tour guide, who becomes much friendlier when a panicked Soraya lies and tells him she is Jewish. “Come, this is my students,” the tour guide says. “I teach them history. You know, they can climb here, in these ancient ruins, learn about their roots, how we turned this biblical land into life again.” As heavy-handed as this tour guide’s empty rhetoric was, I still found it difficult to empathize with Soraya and her mission. That desire to defy history and its fractal multiplications, to turn back one clock while all the others continue to tick…though my own ancestral homes were also likely occupied by the descendants of opportunists and thieves, I could not imagine myself attempting such a return. Last summer, I did find myself in my great-grandmother’s Polish village, shaking hands with the town’s friendly but slightly frazzled mayor. I was traveling with a dozen other university students through the borderlands of modern-day Belarus, Poland, and Lithuania on the Yiddishkayt Helix Project. Though my great-grandmother’s town did happen to lie along the program’s scheduled itinerary, I soon became highly aware that the Helix Project was not intended to be a “Jewish heritage” trip to reconnect us with our ancestors or see where they were murdered by the Nazis. Indeed, my ties to Dąbrowa Białostocka were flimsy: I had never even heard the town’s name until I asked my grandmother in anticipation of my trip, and had I not known that it was “my” shtetl, it would not have stood out among the dozen or so others we visited in the region. 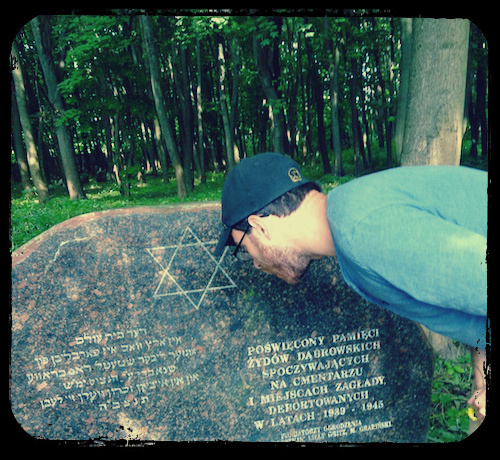 During our short time in Dąbrowa, we visited an old windmill and explored the tree-covered Jewish cemetery. Though it was better maintained than many I had seen, the damp earth was still swallowing the remaining chunks of tombstone and sifting up anonymous shards of bone. I simply couldn’t imagine a new life for me there, in some house which, even if it still stood, was certainly not the gorgeous villa overlooking the Mediterranean that I had seen in Salt of this Sea. 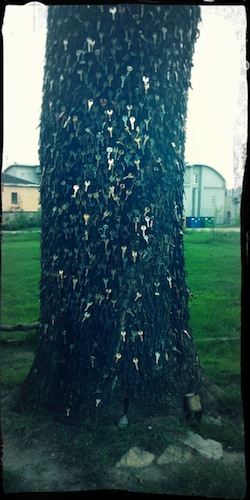 A tree in Panevėžys, into which hundreds of keys have been hammered. Lithuania • July 2014. Another stop on our journey was Panevėžys, Lithuania, once the site of a renowned yeshiva. The town did not only produce famous religious scholars, however: Benjamin Zuskind, a talented actor, colleague of Mikhoels and another victim of Stalinism, was born near there, as was the scientist Gideon Mer. Mer emigrated to Rosh Pinna in Palestine before World War I and subsequently played a crucial role in the eradication of malaria in the country. Gideon’s daughter, Arna Mer, abandoned the Zionism of her father for the Israeli Communist Party and one of its scions, a Palestinian Christian named Saliba Khamis. Their son, the actor and director Juliano Mer Khamis, founded the Jenin Freedom Theater. 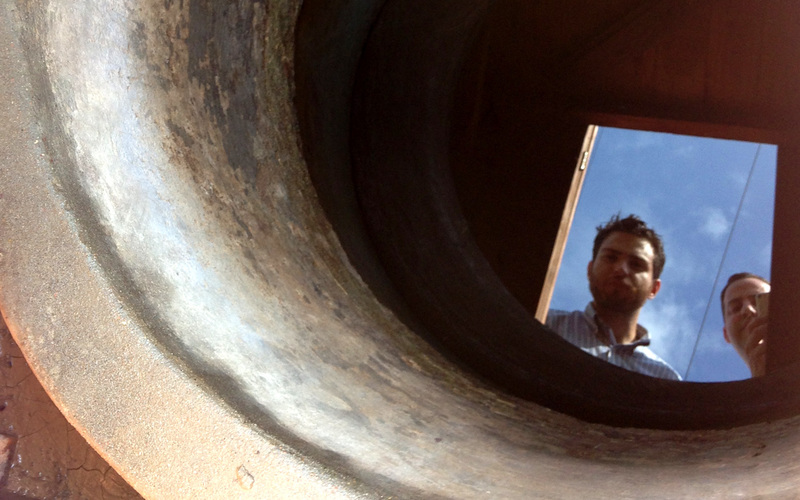 He also played the Israeli tour guide in Salt of this Sea. 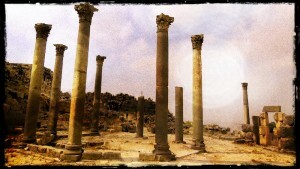 The ruins of a church in Umm Qais (Gadara), Jordan • July 2012. Eastern Europe wasn’t the first place I encountered ruins and thin, persistent traces of history that sneak across borders and simple, convenient narratives. Two years before going on the Helix Project, I spent a summer studying Arabic in Jordan, where over half the population is of Palestinian descent, and many young people still answer the question “Where are you from?” with “Haifa,” “Nablus,” or the name of one of four hundred villages depopulated in 1948 that for most Israelis might as well be “ancient ruins.” That summer, I visited Gadara, a true ancient ruin, a city where the Gospels say that Jesus cast a legion of demons out of a suffering man and into a herd of swine. He then drove the pigs down the hill to the Sea of Galilee, a hazy blue blob in the near distance which is now a country, a language, an entire world away. Standing atop a Gadarene column, Jordan • July 2012. I didn’t come to Poland or Lithuania for proof that what I said then was true, to stare at gas chambers and mass graves until I could be sure. I came in search of something intangible: the ability to imagine the civilization that Jews created among those forests and lakes and plains, a civilization of severe rabbis and Revisionist Zionists but also of men and women, poets and activists who believed in mentshlekhkayt — a faith in humanity and kindness — and dreamed of a free, borderless world. Of course, the more I learn about that civilization, the more I am aware of its absence, the more deeply I know the answer to my teacher’s question, in all its human pain. Juliano Mer Khamis, that grandson of Panevėžys and of Nazareth, considered himself “100% Palestinian and 100% Jewish,” a practical impossibility in today’s Middle East. He was murdered in 2011 by a masked gunman in Jenin, the city where he’d founded a theater he hoped would be a nurturing ground for a new generation of freedom fighters in a “cultural” intifada. There were many in Jenin who’d come to distrust Mer Khamis, fearing that he and his theater were causing social degeneration within their communities. He was smeared as an atheist, a communist, a Jew. The unsolved crime and its motives, like Mer Khamis himself, continue to defy simplistic narratives. At its base, all narrative, all history is the drawing of lines between points on a map, the finding of intriguing symbols and meanings created where the lines come together. Eventually we all intersect, like it or not. Eventually we find what we are looking for, even if only we can see it, perhaps especially if no one cares to hear the story. Of course the lines I’ve drawn in my travels aren’t parallel: history never repeats itself, because it continues on in the interim. But that doesn’t make history a self-defeating endeavor: that Gideon Mer, Benjamin Zuskind, and Shloyme Mikhoels grew up just a few miles from each other in Lithuania may be random, but not insignificant. The lines drawn by Stalin, by whoever decided that Juliano Mer Khamis was too Jewish or too Arab or too provocative to live — those lines are straight and razor-sharp. This isn’t about finding my roots or reclaiming my great-grandmother’s house in Dąbrowa Białostocka. It’s not about the path backwards from Panevėžys to some essentialist origin-story, but the path forwards, to Rosh Pinna, to Nazareth, to Jenin, where Juliano Mer Khamis — whatever he was or wasn’t — chose to be. It’s not about the Nazi or Stalinist killing fields of Belarus or a blood-spattered alley in a refugee camp; it’s about those who chose and choose to love and create in the shadows of the world’s walls. They were always there, wherever we are. This moist air is mine.